Ocean Quigley is an oil painter based in the Bay Area. Both of his parents are artists, and he’s been a painter all of his life. He grew up in Hawaii and in Maine, went to art school at Parsons in New York, and at CCAC in Oakland. Ocean works from life. For him, this is a discipline and devotion to the sensual world. Painting is a practice of paying close attention to the specifics and particulars of what’s actually there. 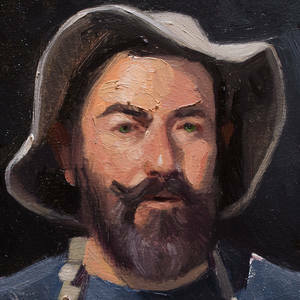 He paints in a direct, alla prima method, usually in a single session. He thinks of painting as a performance, like singing or dancing, something that’s done in time, and that demands virtuosity and complete focus.